Wondering what gluten-free Easter candy is available this year to place in your child's Easter basket (or to enjoy yourself)? Here's the list of gluten-free Easter candy. As you'll see below, there are plenty of options you can use to make up a really nice gluten-free Easter basket. Unless otherwise noted, these candies are considered by their manufacturers to contain less than 20 parts per million of gluten, which makes them "gluten-free" according to the U.S. Food and Drug Administration's legal accepted definition. One note: There seems to be plenty of debate each year over whether Cadbury Creme Eggs are gluten-free or not. In the U.S., Cadbury Easter products are made by Hershey's, which does not consider them to be gluten-free due to the potential risk of gluten cross-contamination in manufacturing. However, the eggs appear to contain no gluten ingredients. (Hershey's will specify any gluten-containing ingredients on the label.) They are manufactured in a plant that also processes tree nuts and peanuts, but not wheat. Use caution with Cadbury Creme Eggs because Hershey's does not consider them gluten-free—despite safe-sounding ingredients, they may contain trace gluten. Easter-themed Dove chocolate products are generally safe. They include: Dove chocolate Easter bunnies, Dove egg-shaped candies, ​and Easter-themed Dove bars, including Dove dark chocolate eggs, milk chocolate eggs, milk chocolate coconut creme eggs, milk chocolate peanut butter eggs, and caramel and milk chocolate flowers. Always check the label, as some products may note "made on equipment shared with wheat." Manufacturer Mars Inc. states that it will identify gluten ingredients (including barley-based ingredients) on the product's label. Some Easter-themed M&Ms chocolate products are considered safe. They include: plain M&Ms, solid milk chocolate Easter bunny, M&M candies in Easter colors, and egg-shaped M&M candies. Gluten-containing and cross-contaminated M&M products include: pretzel M&Ms (which contain gluten) and some specialty flavored M&Ms, (which contain warnings about shared equipment). Beware especially of special M&Ms on sale for Easter, as some of these (the more exotic flavors) contain a warning about a shared facility. Vanilla Cupcake M&Ms have a "may contain wheat" warning, as do milk chocolate egg-shaped M&Ms, specially wrapped for Easter. However, the peanut egg-shaped M&Ms appear safe. Again, always check the label, as Mars Inc. will call out any potential gluten cross-contamination on the label. Plain milk chocolate regular-sized Hershey's Kisses in Easter-themed foil wrappers are considered safe. However, not all Hershey's Kisses are safe; many flavors are not. Jelly Belly jelly beans (including licorice flavor jelly beans) and all Jelly Belly specially themed Easter packages are gluten-free. Easter-themed Starburst candy, including jelly beans and special Easter candy packages, are gluten-free. Easter-themed SweeTARTS candy contain no gluten ingredients, according to manufacturer Nestle, which says it will disclose any potential gluten cross-contamination on the label. Note that the SweeTARTS jelly beans are not considered gluten-free. Easter-themed Tootsie Roll candy, including Dubble Bubble Easter egg-shaped bubble gum, Tootsie Pops, Charms Blow Pops and Charms Candy Carnival products, are gluten-free. Peeps marshmallow treats by Just Born. Check the label to make sure it states "gluten-free" below the list of ingredients—most do, but a few are made in shared facilities, especially some of the newer, more offbeat flavor combinations. Also, note that one new Peeps flavor involves Oreo cookies—real Oreo cookies, made with real wheat. 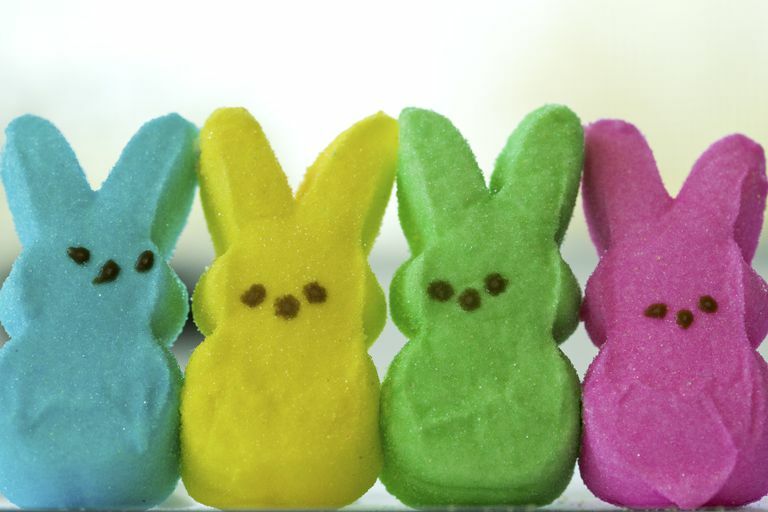 That kind of Peep is most definitely not safe, so steer clear. Kraft Bunny Mallows and Egg Mallows (marshmallow Easter-themed treats). Kraft Foods Group Inc. does not label many foods gluten-free, but it will clearly disclose any gluten ingredients on the label. Again, these candies are considered gluten-free to less than 20 parts per million. If you have any questions about a specific product, contact the manufacturer.